Entertainment One is releasing Decoding Annie Parker this October, a film based on true events that chronicles the tribulations of a breast cancer survivor and a geneticist, trying to beat the disease. Waged on both scientific and emotional fronts, “Decoding Annie Parker” is the hopeful and touching story of two remarkable women and their 15-year battle against the cruel and insidious illness, breast cancer. Annie Parker (Samantha Morton) has a personal relationship with the disease. Her mother and her sister died of it and, ultimately, she is diagnosed with it too. Naturally affable with an offbeat sense of humor—even in the face of her own mortality—she struggles to hold her family and life together, as her body betrays her. Meanwhile, geneticist Mary-Claire King (Helen Hunt) is convinced there is a link between DNA and cancer—even if no one in her profession shares her belief. Against the advice of nearly all of her colleagues, she persists in her research and it’s her dogged pursuit for funding that leads to the groundbreaking study that draws the two women together. Joined not just by the disease, Parker and King discover their shared determination and unconventional approaches to their research and lives. With grace and humor, “Decoding Annie Parker” chronicles how these remarkable women work to make one of the most important genetic discoveries in recent history. 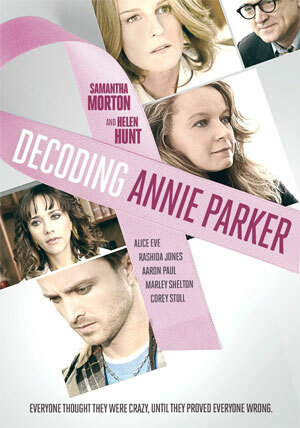 “Decoding Annie Parker” will be available on September 30 for $29.98 on Blu-Ray Disc and $24.98 on DVD.